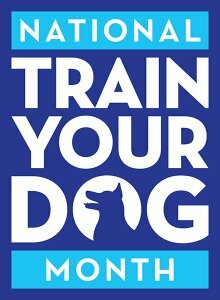 We are one week into the APDT’s National Train Your Dog Month (NTYDM) for January. The month-long event stresses the importance of canine training among pet professionals, as well as families with four-legged members. Education is the APDT’s core mission, and NTYDM is our version of a public service announcement that enables canine professionals to better service their clientele and help more pets and people live better, happier lives together. So how do we get that message across? By using social media outlets to share the value of training dogs. Don’t forget to wear your National Train Your Dog Month long-sleeve T-shirts in our signature blue with our logo on the front and Don’t Blame Them. TRAIN THEM! slogan on the back. Please visit www.trainyourdogmonth.com to see the free resources for pet lovers, like tips on kids and pets interacting; considerations for multi-pet homes; understanding training methods and busting dominance myths; plus how to find the right trainer for you and your pet’s needs. Thanks to our members who helped create these insightful references. Those resources on our website may be found at apdt.com/petowners. Encourage shelters and other animal organizations to also promote NTYDM. Dogs with just the basic training are less likely to be turned into shelters, and with a little knowledge, their owners can find out what they are doing to cause reactive behaviors in their animals. It’s a win-win for us all!